CENTRE HALL — Donald Ray Lucas was a Private First Class in the U.S. Marine Corps, and served in the Vietnam War. On Jan. 12, 1969, Lucas was killed by a grenade. He was the only soldier from Centre Hall to die in that war. On Dec. 23, about 85 people gathered at the American Legion Post #779 building in Old Fort to dedicate a section of state Route 144, stretching from Potters Mills to Old Fort to Lucas’ memory. 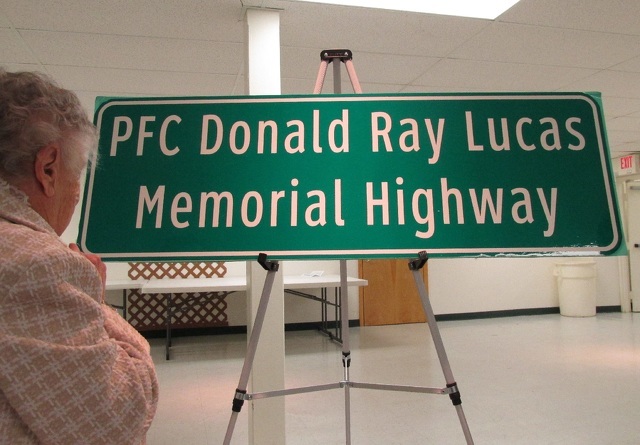 That section of road will be known as the PFC Donald Ray Lucas Memorial Highway. In attendance were Centre County Commissioner Steve Dershem, State Representative Kerry Benninghoff, U.S. Congressman Glenn Thompson, PennDOT Assistant District Executive Karen Michael, many local veterans, current Marine Corps members, and American Legion members, as well as several members of the Lucas family, including Lucas’s 94-year-old mother, Viola Lucas. Michael opened the ceremony with thanks to everyone involved in honoring Lucas. She introduced Benninghoff, who addressed the crowd, emphasizing the importance of remembering those who gave their lives in times of war. He noted that Lucas was a young man sent off to a faraway land to fight for people he didn’t know to have the same rights and freedoms we have in America. Benninghoff sponsored Pennsylvania House Bill 2409, which officially dedicates the section of route 144 to Lucas. Congressman Glenn “GT” Thompson spoke, thanking veterans advocate Jim Hironimus, who he described as a catalyst in getting the road dedicated to Lucas. Matt Wise, representing state Sen. Jake Corman, who was unable to attend the ceremony, spoke next, thanking all the veterans and service members in the audience for their service. “These signs are a reminder to us all when we’re driving down the highway that we honor our service men and women,” said Wise. He also thanked Representative Benninghoff for sponsoring the legislation honoring Lucas. To conclude the ceremony, Viola Lucas was brought forward and unveiled an example of the signs that will be placed along the memorial highway. American Legion Post #779 Chaplain Nate Summers closed the ceremony with prayer.